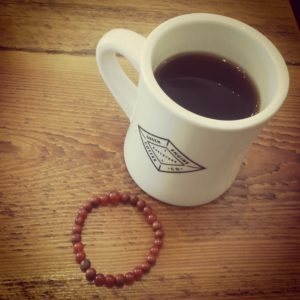 I slip the mala from my wrist and begin moving my fingers from bead to bead. I think of those sharing this space with me and hold them in my heart. My eye catches the plants growing in the middle of the love of this community. I hear the sound of a little girl beeping her plastic horn. I feel the connection between those conversing around me. I marvel at this experience of meditation with eyes open to the world around me. I recognize the need to keep my eyes wide open to the world, always. I wish more people could find the courage to open their eyes. I let the world soften for this moment. I feel gratitude for my hands. I feel gratitude for the tears that have found their way out in recent days. I give myself permission for my practice to be what it needs to be in the moment. I think of my sweet girl and the hope that lives within the love in her heart. I wonder if my coffee will stay warm (truth, because the mind wanders). I feel connection to all of those around me, in this room and to the far reaches of our planet. The sun shines through the windows and fills my soul with light. I feel safe in this place. The wood, the coffee, the conversation grounds me. I am reminded that home is in the heart and we carry it with us wherever we go. We must keep our eyes on the big picture, on the future that is built from the now. When we feel the connection and feed the connection we grow the connection. All beings all beings all beings. May my thoughts words and actions in some small way contribute. May my life be a contribution. To the happiness and freedom for all. For all for all for all. This entry was posted in Uncategorized on February 28, 2017 by Xandra. 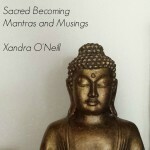 Yes, I want the Sacred Becoming Mantras and Musings and weekly love notes!